Growing peaches, (Prunus persica) and nectarines (P. persica) in South Carolina can be both fun and rewarding, providing you with the opportunity to put part of the lawn area to good use by producing a fruit that is both enjoyable to eat and healthful. The success of your peach-growing enterprise will depend largely on the care and attention the trees are given throughout their lifetimes. Nectarines are nothing more than fuzzless peaches, and their culture is the same as peaches. For simplicity, the term peach refers to both peaches and nectarines in this fact sheet. More information is available in HGIC 1355, Pruning Peaches & Nectarines, and HGIC 2209, Peach Diseases. Sunlight, and plenty of it, is the key to maximizing fruit production. Pick an area where the trees will be in the sun most or all of the day. The early morning sun is particularly important because it dries the dew from trees, thereby reducing the incidence of diseases. If the planting site does not get plenty of sun, then you can not expect the best performance from the trees. Avoid very steep or badly eroded hillsides and areas having poor air circulation and poor soil water drainage. Select healthy 1-year-old trees, about 3 to 4 feet tall and with a good root system. A small tree with a good root system is more desirable than a large tree with a poor root system. Trees that are 2 years old or older do not usually grow as well as 1-year-old trees. Frequently, older trees do not have sufficient buds on the lower portion of the trunk to develop a good framework. Do not purchase trees that appear stunted, poorly grown, diseased or insect-injured. Check the trees closely to make sure that you are getting the cultivar and rootstock that you desire. The various peach varieties ripen in the Upstate of South Carolina from mid-June to mid-September. Pollination: Peach flowers are self-fruitful. Therefore, it is not necessary to plant more than one peach variety in the backyard. Chilling Requirements: Stone fruit trees such as peaches develop their vegetative and fruiting buds in the summer, and as winter approaches, the buds go dormant in response to both shorter days and cooler temperatures. These buds remain dormant until they have accumulated sufficient chilling hours (temperatures of 45 °F or less). Varieties with low chilling requirements are recommended for coastal areas. As long as there have been sufficient chilling hours, leaves and buds develop normally. Without enough chilling hours, trees may develop one or more of the following symptoms: (1) delayed leafing out and flowering; (2) reduced fruit set and quality; (3) increased small, misshapen fruit (“buttoning”). Lovell: For most of South Carolina, has been the best rootstock. Nemaguard: This rootstock is used in the Coastal Plains, because of widespread root-knot nematode problems. Guardian: This new rootstock has performed well on soils infested with ring and root-knot nematodes. Guardian has proven to be superior to other rootstocks on nematode-infested soils. Recommended Varieties: There are peach varieties adapted to most areas of South Carolina (see table 1). Varieties with low chilling requirements are recommended for the coastal areas. 1Major land areas of South Carolina; M – Mountains; P – Piedmont; SR – Sandhills and Ridge; CP – Coastal Plains. 2Average ripening dates for Byron, Georgia, which are similar to the Sandhills and Ridge region. Dates may vary according to season. Piedmont and mountains are 7 to 10 days later, and Coastal Plains are 7 to 10 days earlier. Although peach trees will grow well in a wide range of soil types, a deep soil ranging in texture from a sandy loam to a sandy clay loam is preferred. Peach trees are extremely sensitive to poorly drained soils. In areas of poor drainage, roots will die, resulting in stunted growth and eventual death of the tree. Most fruit trees, including peaches, grow best where the soil pH is near 6.5. Since the natural pH of most South Carolina soil is below this level, it is necessary to incorporate lime before planting to raise the pH to the desired level. Follow soil test results to determine soil pH and fertility levels. Peach trees should be planted while fully dormant from early December to mid March. Because root growth may occur during relatively mild winters, plant as early as possible so the roots will establish before spring growth begins. When the fruit trees arrive from the nursery, open the bundles immediately. Soak the roots in water for 6 to 12 hours if they are not moist. The trees should then be planted if the soil is not too wet. If the soil is not prepared where the trees are to be planted, or the ground is too wet, heel the trees in by placing them in an open trench deep enough to cover all roots. The north side of a building is the best place for heeling because the trees will remain dormant longer. Place soil over the roots to the depth they will be planted in the garden or landscape. Before planting, prepare the soil thoroughly by plowing or spading followed by disking or raking to smooth the surface. If you have not adjusted the soil pH to 6.5 previously, liming should be done before you prepare the soil so that the lime will be mixed throughout the planting area. When added to the surface and not plowed in, lime takes years to move down into the soil. Lime an area 10 feet by 10 feet where each tree is to be planted. Similar to lime, phosphorus moves down through the soil slowly and thus should be incorporated along with lime before planting based on soil test results. When planting, dig holes large enough to receive roots freely without cramping or bending from their natural position. Before planting, cut off all broken or damaged roots with a sharp knife or pruning shears. Keep root pruning to a minimum. Set the plants at about the same depth they were planted at the nursery so that the uppermost root is not more than 1 to 2 inches underground. Work the soil in and around the roots. When the hole is half-filled, firm the soil with your feet before you finish filling the hole. When the hole is filled, pack the soil firmly. Do not leave a depression around the tree. Do not place fertilizer in the planting hole or fertilize immediately after planting. After planting, apply sufficient water to thoroughly soak the soil in the area of the tree roots. This watering will help bring the soil into closer contact with all sides of the roots and eliminate air pockets around the roots. Keep weeds out of a 3-by-3-foot area around the tree because they compete with the tree for moisture and nutrients during the growing season. This will also keep mowers away from the tree and reduce trunk damage. Mulching will help to control weeds as well as conserve moisture. Peaches and nectarines are usually trained to an open-center system. Correctly pruned trees will have a wide open vase shape. This allows for better sunlight penetration and air movement within the canopy, and improves spray coverage. More information is available in HGIC 1355, Pruning Peaches & Nectarines. Fertilizing peaches starts with adjusting the soil pH to 6.5 before planting. Please see HGIC 1652, Soil Testing. Incorporate the lime at least a foot deep and over an area about 10 feet by 10 feet where the tree will be planted. In March after the trees have been planted and the soil settled by a drenching rain, broadcast 1 cup of 10-10-10 fertilizer over an area 3 feet in diameter. Do not allow fertilizer to accumulate around the tree trunk. In May and again in July, broadcast ½ cup of calcium nitrate or equivalent over an area 3 feet in diameter. The second year, fertilize trees in March (4 cups of 10-10-10), in May (2½ cups of calcium nitrate) and again in July broadcast ½ cup of calcium nitrate or equivalent over an area 3 feet in diameter. Do not apply fertilizer after the first of August. Late applications may cause young trees to become prone to cold damage. Spring (bloom to petal fall) Application: Apply 1 cup of 10-10-10 fertilizer per year of tree age to a maximum of 10 cups for mature trees. Postharvest Application: Apply 1 cup of calcium nitrate per year of tree age to a maximum of 4 cups for mature trees. Do not make the August application if the crop was lost to a freeze. Do not apply until the harvest of late-season varieties is completed. A peach tree cultivated under favorable conditions will set more fruit than it is capable of successfully carrying to maturity. Branches may break and the fruits typically have poor color and taste. To prevent limb breakage and ensure good fruit quality, excess fruits must be removed or thinned. Hand-thin the tree about four weeks after full bloom, spacing the peaches about 6 inches apart on the limb. 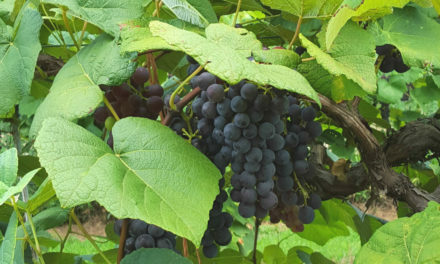 When thinning by hand, grasp the stem or branch firmly between the thumb and forefinger and pull the fruit off with a quick motion of the second and third fingers. Clemson Fruit Bag developed for the home orchard and hobbyist fruit gardener. Guido Schnabel, © 2015, Clemson University. In South Carolina, control of peach pests and diseases is a challenge. For more information, please see HGIC 2209, Peach Diseases and HGIC 2210, Peach Insect Pests. The most damaging peach disease is a fruit rot commonly called brown rot. There are a number of insects that cause damage and entry ports for rots. These insects include plum curculio, stink bugs, grasshoppers, beetles and moths. Commercial growers typically spray fungicides and insecticides on a 7 to 10 day interval between bloom and harvest to protect the fruit from damage or rot. If the homeowner opts to use a spray program, it should begin with dormant sprays and be carried through the growing season. 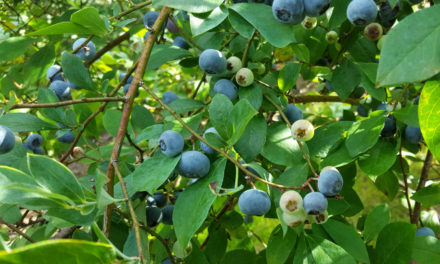 Although products are available at gardening stores for homeowners, many gardeners are not inclined to use pesticide applications for home fruit production. Instead, hobbyist gardeners may use bags to protect fruit from pests and diseases. Clemson University has tested and is promoting the use of specialty bags that, if used properly, allow for production of high quality fruit with very little pesticide input. The bags are recommended for use in a three step fashion: (i) properly take care of your trees to minimize tree stress; (ii) protect your fruit from pests and insects between bloom and the day of bagging; and (iii) enclose nail-sized, green fruit (typically 3 weeks after bloom) with a specialty bag to be removed at harvest. For purchase information and use instructions please see: Clemson Fruit Bags or simply google this page using the key words “Clemson Fruit Bags”.